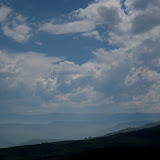 We spend most of the next day driving up along the edge of the Drakensberg. We take the smaller roads, so the going is slow, but with the mountains always in view, the scenery is fantastic for the entire drive. Along the way we pick up a wandering, hebrew inspired, bhuddist, spiritual journeying hitchhiker named Ashier. He provides some interesting conversation along the way. Eventually we arrive in Golden Gate national park which is set in the far northern part of the range. It has very characteristic golden/red, carved, sandstone cliffs. The day was very overcast, as we were setting up our tents the sun somehow broke through to light up the cliffs in the most amazing glowing, golden light. The photos really don’t do justice to the amazing glow of those cliffs for just a few minutes before the sun disappeared behind the hills. In the morning we stopp for coffee at a lovely little town called Clarens. Apparently it is very popular with local artists. We don’t have time for more than a coffee though as we must push through to Joberg. The next day we find ourselves at the airport again, bording a flight to Harare. Adventures of Dean and Sophie is powered by	WordPress 2.8.5 and delivered to you in 2.485 seconds using 33 queries.